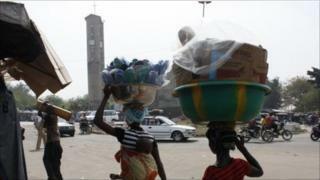 Electricity and water have been cut off to northern Ivory Coast - as the crisis over November's election escalates. The poll was supposed to reunify the country, split since an armed rebellion in 2002 between the north, traditionally loyal to Alassane Ouattara, and the south controlled by President Laurent Gbagbo, who is refusing to hand over power. A university professor told the BBC World Service about how the cuts are affecting life in the former rebel stronghold of Bouake. "People are running for water. We're going for wells to get some water. For the electricity, the situation is very dramatic. We've no iced water, the food and particularly the meat and the milk products in our fridges are in very bad condition. The trouble is, we have not been informed beforehand - we've had no water or electricity since Monday. It's only on Wednesday afternoon that we heard on the radio that the government of Laurent Gbagbo sent some experts who were accompanied by some military forces who have ordered this cut of electricity in our zone here controlled by the former rebels. Everyone is making their own effort to get water. Personally I will go to the well - maybe I'm lucky to have one well in my yard. But I can see people who are carrying baskets and water buckets going here and there for water. It's not easy for them at all. It's a very terrible situation. The trouble is that we don't know how long it will go on, so we are living in total uncertainty. We don't know for sure when all this ill-treatment will stop. I think if those political leaders really love their population, they should think of them. Because in the [northern] zone here we have some people who are supporting Laurent Gbagbo and others who are supporting Alassane Ouattara. It's not fair to punish us for one person. Think of the people in the hospitals, think of people who have to undergo surgery. Without any water or electricity, people will be dying, dying for nothing. As well as the cuts to the water and electricity, we have also have a problem with our salaries. The civil servants in particular don't have their salaries for the time being. I haven't been paid for one month. I was told that the money is coming but I haven't got it yet. They are telling us it will come very soon. We have been told we have to go to Abidjan to get our money but it's not easy. Personally I don't understand how people can behave like this. We want peace. We want Gbagbo and Ouattara to come to a positive resolution. I don't know how those two leaders can look at the people suffering like this and then say that they love this population. This is a sort of irony. I blame both of them; both leaders are responsible for this situation. And also the international community, those people who were supervising the election - what are they waiting for? What solution do they want for Ivory Coast?"